The stock market has enjoyed a great run since the election of Donald Trump. But experts are wondering if the Trump bump may have eaten into some of Wall Street's potential gains for 2017. Trump's victory led to an explosive rally in stocks of financial, health care and industrial companies. Investors are betting Trump and the Republican-led Congress will roll back some Wall Street and health care reforms put in place under President Obama, cut taxes and approve $1 trillion in stimulus for roads, bridges and other infrastructure. But has the stock rally gone too far too fast? "It has been a furious move predicated on promises about infrastructure spending, anticipation of tax cuts and softening of regulation. But it's gotten a little bit ahead of itself," said Bill Northey, chief investment officer of the U.S. Bank Private Client group. Others worry that the surge in longer-term interest rates since the election could wind up being a problem in 2017 unless Trump is actually able to deliver on all he promised. That will be no easy feat. "If there is an actual pickup in growth from stimulative policies, then the market should be fine," said Bryce Doty, senior portfolio manager at Sit Investment Associates. "But if rates go up just on the hope of stimulus? That could be a precarious situation." To be sure, experts aren't necessarily worried that Trump is going to derail the economic recovery or put an end to the bull market -- which has now been raging since March 2009. The fear is that investors are just way too optimistic, perhaps naively so. CNNMoney's Fear & Greed Index, which measures seven gauges of investor sentiment, has been showing signs of Greed and Extreme Greed since Trump's victory. It's a stark turnaround from just before the election, when the index was at Extreme Fear levels, partly due to concerns about growing momentum for Trump's campaign. The rapid shift in Wall Street's mood could be a sign that the market will need to take a breather in 2017 unless there is solid evidence that the economic and earnings growth can accelerate. In other words, investors might start looking to lock in some of their 2016 gains until there is more evidence that Trump can truly deliver on his major campaign promises. "I'm happy about the rally. But it is a honeymoon rally though. I'm a little more bearish now," said Randy Swan, manager of the Swan Defined Risk Strategy fund. 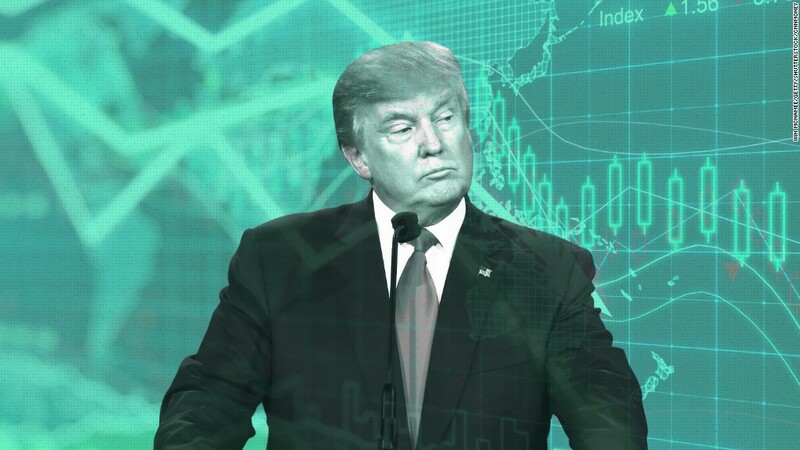 Milton Ezrati, chief economist at Vested, adds that it will be difficult for Trump to get Congress to pass the type of stimulus he wants as quickly he might like. Ezrati thinks investors may be disappointed if they really believe Trump can "drain the swamp." "The term 'shovel ready' is a bit of a misnomer. Nothing will actually happen until end of 2017 at earliest," Ezrati said. "There still is a lot of doubt about what Trump can get done. He is an unknown commodity, politically." The good news is investors are hopeful that Trump's policies will be good for Wall Street and Main Street. If corporate and consumer confidence continues to rise, that should lead to more hiring and increased spending by businesses and average Americans. And that could help mitigate the negative impact a stronger dollar would have on earnings if Trump, Congress and the Federal Reserve bring about more inflation. Remember, the Fed is likely to keep raising rates next year after hiking them earlier this month. Hank Smith, chief investment officer at Haverford Trust, said he is still bullish because he thinks earnings should be able to grow at a healthy pace if Trump does wind up having a pro-business agenda. But nobody is really certain what Trump will do once he takes office. His incessant tweeting isn't helping matters, especially when he's bashing big corporations like Boeing (BA) and Lockheed Martin (LMT). And if Trump decides to move more to the alt-right and fulfill the protectionist promises from his campaign, that could be very damaging to stocks and the economy. Experts think trade wars with China and Mexico would be bad for everyone. "The trade rhetoric from Trump is hopefully more bark and not bite," Haverford's Smith said. "If he really slaps big tariffs on imports, that is the biggest risk for the market."